The Thames Tunnel was the first subaqueous tunnel constructed underneath a navigable river. It was built between 1825 and 1843 and designed by Marc Isambard Brunel. The tunnel is 35 feet (11 m) wide by 20 feet (6 m) high, it is 434 yards (396 m) long, and 25 yards (23 m) below the river surface. When it was completed it was called the "Eighth wonder of the world". Brunel was the third attempt to build a tunnel under the Thames. 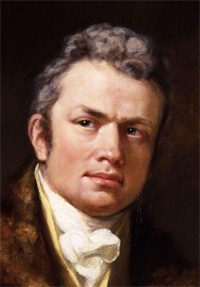 1799, Ralph Dodd (c. 1756-1822) was the first person to try but water leaks foiled the attempt. 1805, Robert Vazie (b.1758) and Richard Trevithick (1771-1833) tried but water ingress and poor ground conditions led to the works being abandoned. The attempts that had failed led engineers to consider it impractical. But this did not deter Brunel. 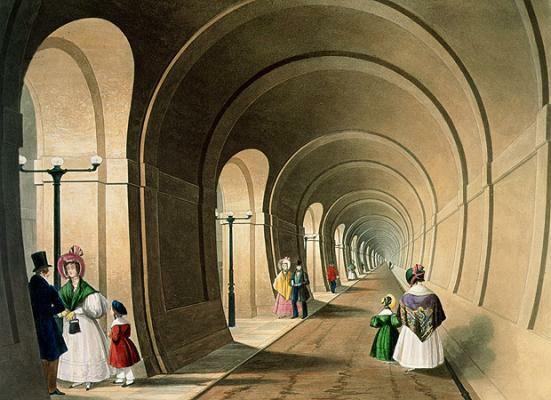 In January 1818 Brunel patented a revolutionary tunnelling shield a major leap in tunnelling technology. This protected workers and improved safety of the tunnel collapsing. Work began in 1825 with the the building of the shafts down to the tunnel. This in it itself was a marvel of engineering. 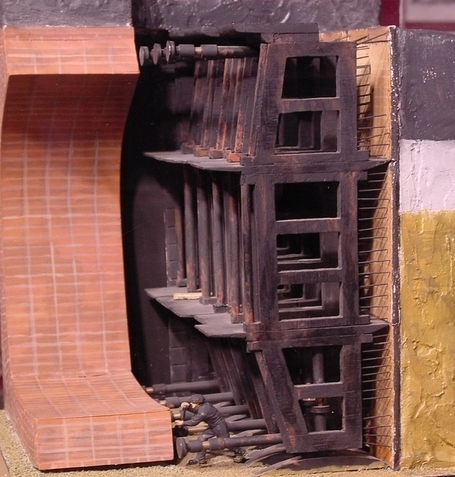 Instead of digging a hole then building inside, Marc Brunel had the 50 foot wide and 42 foot high shaft built on top of a 25-ton iron hoop, at ground level. This structure was then sunk into the soft earth under its own weight! Crowds came everyday to see the shaft disappearing into the ground. The shaft is now next to the Brunel Museum in Rotherhithe village. When both shafts were in position miners were hired from coal mines and the tunnel excavation began. During the building work in 1826 the assistant engineer fell ill and was replaced by Brunels son, Isambard Kingdom Brunel.